French Press Coffee Maker, Giving You Hands Down the Best Flavor! Glass Coffee Press Can Be Also Be Used for Tea, Herbal, Fruity Drinks and More! 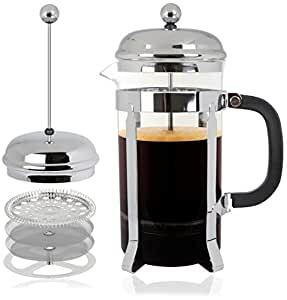 French Press Glass Coffee Pot Has 5 Part Filtration System: Glass Coffee Press Includes Stainless Steel Plunger, Heat Resistant Borosilicate Glass; Glass French Press Makes 8 Cups/ 34 oz of Delicious Hot Coffee. Mr. Kitchen by Kangaroo – Dual Filter Offers Maximized Filtration As It Separates Undesired Coffee Grounds or Tea Herbal Base, Allowing For the Maximum Flavor! No French Press Kit or French Press Machine is More Beloved by Coffee Connoisseurs. French Press is Resistant to Boiling Water, Dual Stainless Filters. Threaded Base Plate, Spring Plate Offers a Tight Seal Between the Coffee Press and Pot Maximizing the French Pressâs Ability to Filter.